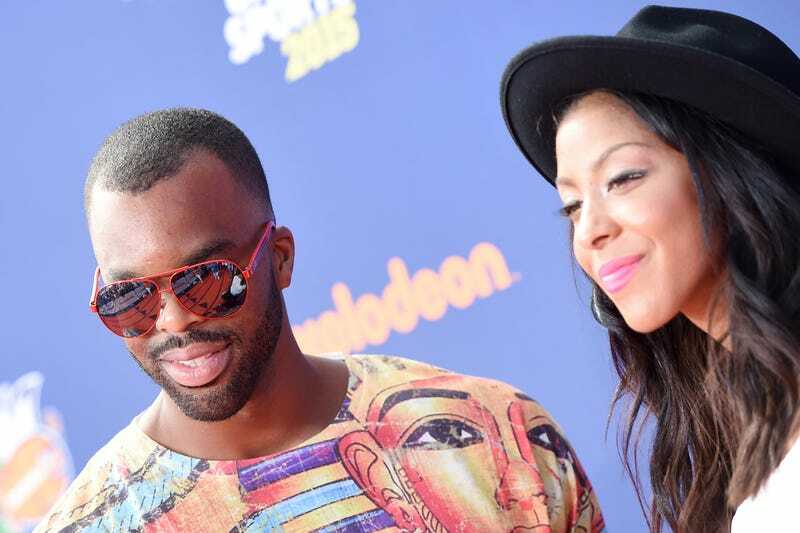 Shelden Williams and Candace Parker at the Nickelodeon Kids’ Choice Sports Awards 2015 at UCLA’s Pauley Pavilion on July 16, 2015, in Westwood, Calif.
Candace Parker is a legit WNBA star with endorsement deals and a name that rings outside of WNBA circles. Her ex-husband, Shelden Williams, was an NBA bust who basically rode the bench of several NBA teams for six years before the basketball gods realized that the NBA was no place for Shelden Williams. So now, because life isn’t fair, Parker reportedly has to pay her ex-husband $400,000 in alimony despite the fact that the NBA grossly overpaid Williams some $12 million to wear a warmup uniform on game days and participate in the layup line before the game and during halftime. According to TMZ Sports, Parker married Williams in 2008, the same year that she would be drafted No. 1 by the Los Angeles Sparks. No one in the black community understood this union. Parker was a sensation in high school, a legend at the University of Tennessee and poised to become a breakout star in the WNBA. Williams was a decent player for a Duke team full of decent players, was taken fifth in the 2006 NBA draft, and spent two years before marrying Parker perfecting his hand-clapping and high-fiving to actual playing teammates. He was a support player at best. And how can I put this? Parker was then and still is beautiful, while Williams looked like an over-the-knee boot that fell off the back of a pickup on the highway. But here’s the part that makes all of this even more annoying: Although Parker is one of the WNBA’s top players, she still had to play overseas during the offseason to reach her earning potential. As an NBA bust, Williams still earned millions to ride the team bus. And because life isn’t fair and Donald Trump is president, Parker must pay Williams close to half a million in lieu of having to pay him ongoing spousal support. TMZ Sports also notes that the couple will split the profits from their former home in Encino, Calif., which they just sold for $3.75 million, and share joint custody of their 8-year-old daughter. Neith Parker nor Williams will have to pay child support.